* I may receive a commission if you click on links in this post and make a purchase. 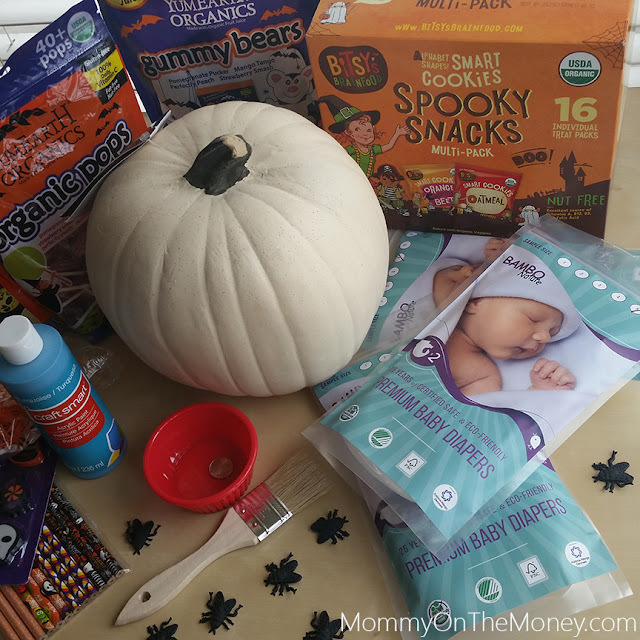 This month, MommyOnTheMoney.com hosted their first Healthy Halloween Planet Playdate event helping families learn how to include children with allergies in Trick-or-treating, and how to make healthier choices in the candy and snacks we give out. 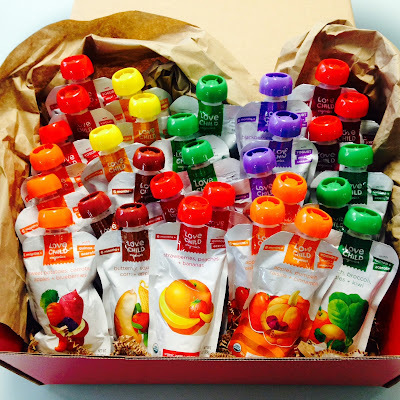 To help spread the word they are hosting a BIG giveaway with prizes for kids to snack on, for babies, and of course Mom too! Find out What Everyone Needs to Know to Have a Healthy Halloween! The Planet Playdate kids painted Teal pumpkins for the Teal Pumpkin Project. These pumpkins are a symbol that your home has non-food treats for kids who have food allergies. You can also download a sign here. The kids at the play date snacked on USDA organic and NonGMO Project verified foods from Bitsy's Brain Food, and YumEarth, and the babies sampled Award Winning Bambo Nature Premium Baby Diapers. and and Love Child Organics fruit pouches. We are giving ALL readers a 14 Day FREE Trial of Grokker.com online yoga videos! One Giveaway Winner will WIN products from the following companies AND a Year of Grokker.com Membership! Read the full Award Winning Bambo Nature Premium Baby Diapers review. Do all kids a favor this Halloween and take care to read labels on what you give out to eat and do your best to care for our kids and our planet. 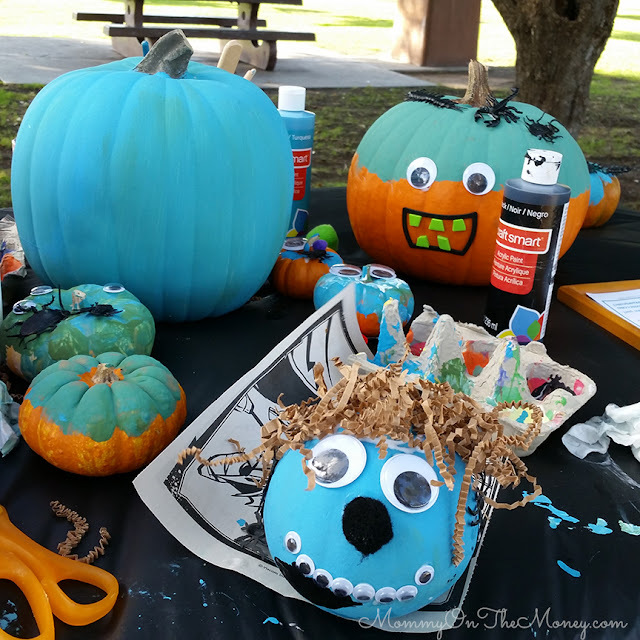 Read all about the Healthy Halloween Planet Playdate and how to host your own Teal Pumpkin Project play date or enter our giveaway below! 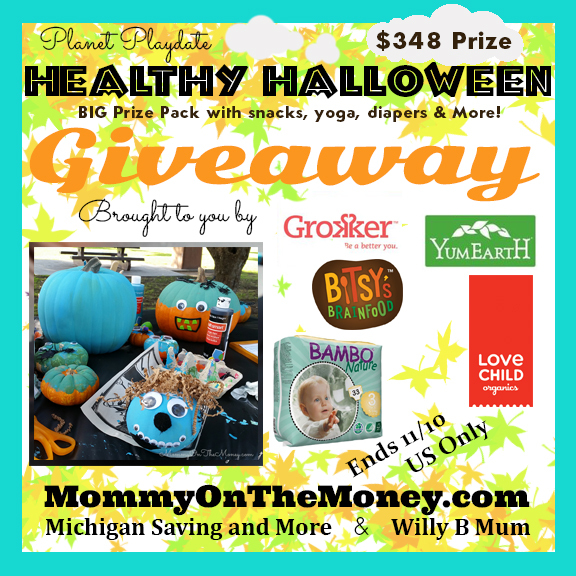 ONE lucky person will win a BIG Healthy Mom and Baby Prize Pack! We are giving away a BIG prize pack of items for baby, kids, and mom to have a Healthy Halloween! These items were provided by the generous sponsors of each prize on the list. Please feel free to visit their sites, try out their products, and enter the giveaway if you want to win! **Winner will be chosen randomly, entry verified, and notified via email used to sign in. Failure to respond within 48 hours forfeits the prize. Each prize will be provided by each individual company. Please allow 4-6 weeks for delivery of prize. MommyOnTheMoney.com reserves the right to substitute a cash prize or Amazon.com for the full or any portion of the value of the prize if necessary due to any potential issues that may arise. I'm really interested in the Love Child Organics! I would love to win! Im most excited about the "1 Bitsy's Brain Food Prize Pack " We have a food allergy kid in this house, I was so happy to see the "teal pumpkin project" Thank you! My grandsons love so many of the Yum Earth Products. I would love to win that for them! I am most excited to win the diapers!